Members of the Association of Wedding Gown Specialists® had good reason to watch the “Weddings of a Lifetime” segment aired in September, 1998, on Lifetime Television for Women. The bride wore her grandmother’s wedding gown, a gown Norville Weiss of Wedding Gown Specialists® in Chico, California, restored to wearable condition especially for the program. Association members, represented in more than 500 cities around the world, were looking forward to seeing the gown on camera. “It’s very satisfying,” said Weiss, “to make dreams come true. Sometimes the bride and her family actually cry with happiness when they see the gown. A wedding gown is always special, and making it possible for the bride to wear a family heirloom is truly a joy.” Weiss and his Association colleagues also restore other heirloom fabrics such as christening gowns, doll clothes, and table linens, many of them dating as far back as the early 1800s. Click here to read a letter of thanks from the bride’s grandmother. 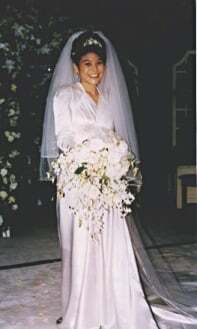 The Association’s interest in the show began in late June, 1998, when the producer of “Weddings of a Lifetime” discovered, just days before the camera crew planned to film the bride being fitted in her gown, that the gown was yellowed and stained. When the producer called the Association office for help, she was referred to Weiss, the Specialist nearest the site of the wedding. Weiss, who restored the gown and then delivered it to the family, admitted he was a little nervous during the three and one-half-hour trip to the film site; he worried about getting into an accident and damaging the gown! Both Weiss and his van were supposed to make a personal appearance on camera, but he was cut in favor of two adorable little flower girls who unexpectedly stopped to dance midway down the aisle to the altar. Members of the Association of Wedding Gown Specialists are represented in countries around the world. Many are longtime friends who look forward to seeing each other at the group’s annual meetings in cities such as Ottawa, San Juan, San Diego, Charleston, and Williamsburg. Association members, highly qualified dry cleaners who for the most part are also members of international, national, and state dry cleaning organizations are committed to reliable cleaning results, the lasting quality of the gown preservation, and complete accountability to the bride. The Association’s trademarked MuseumCare™ preservations, recommended by the Association of Bridal Consultants and National Bridal Service, feature a unique anti-sugar stain treatment to guard against latent stains, a safe, acid-free environment for the gown, and a written international guarantee.